In the year 1596, a sacking at the hands of the Count of Essex almost destroyed the city of Cadiz. 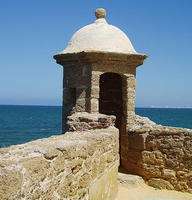 Since then, authorities have focused their efforts on establishing a barrier between the city and the sea, a reconstruction task which has accompanied the inhabitants of Cadiz throughout the last 400 years. The problems that Philip II encountered in halting marine erosion are similar to those that exist today, as well as the solutions. This research project, carried out by researchers from the University of Cadiz and the Andalusian-Atlantic Coasts Department, traces a historic continuity in the tasks of maintaining and reforming Cadiz's walls. Juan José Muñoz, from the department of Applied Physics at the UOC, explains to SINC that the first mention of the city's walls, which Lord Byron baptized as the "Siren of the Ocean", was in the 13th century, along with the city's repopulation carried out by Alfonso X the Wise. In his Papal Bull of 1263, Pope Urban IV spoke to the King, referring to "the reparation that you are carrying out on the Hercules buildings and the restoration of the old walls in a place called Cadiz". Through an exhaustive documentation labour, the authors of the project "The walls of Cadiz and its struggle against the sea", published in the latest Revista de Obras Públicas, compared different sources from the 16th century which made reference to the construction or reinforcement processes of these defensive structures. In one of them, one of Philip II's collections officers, named Horozco, recounts the construction of "a new and high wall, all made of mason stone, with battlements and towers and parapets in each stretch, with a castle and a fortress of ashlar stone, situated on some very old and very strong foundations". After the city resisted numerous attacks, among which figure those carried out by adversaries as feared as Redbeard or Admiral Drake, in 1596, the Count of Essex managed to overcome the scarce resistance offered by Cadiz, and disembarked through the isthmus which joined the city with the island of San Fernando. According to Muñoz, "As a result of the city's destruction, Philip II decided to reconstruct it, after ruling out its abandon and reconversion into a prison". That process brought to light, through the writings of the period, the use of oyster stone in its construction, a shell-fish sandstone from the region extracted from the quarry waters of Puerto Real which has been used throughout the centuries. Even though the progressive construction and reinforcement of the walls and bastions made attacks on the city less frequent, the sea and its sudden attacks have traditionally been the greatest and most constant enemy of this defensive line. Restoration labours have been carried out in an almost permanent fashion. According to Muñoz, "this is so much the case, that the authors on many occasions have a feeling of déjà vu when observing old photographs". Of course, progress has given erosion and undermining solutions a greater capacity in site positioning and material resistance in respect of previous centuries, but these are almost the only differences. The walls of San Rafael and San Miguel, known as the "gale walls", suffered much more from the elements than from any army. Its remodelling was constant between the 17th and 19th centuries, a time in which many of the grand ideas which are applied up to today were developed, such as a breakwater step at the foot of the wall, forming a dike with a 45º angle so that the waves would bounce off of it and hit the wall with much less force. This solution, proposed by the engineer Ignacio Sala in 1728, was improved on by Juan Cavallero (circa 1772), who proposed setting back the upper part to achieve a "wave-bouncing effect". According to the researcher, "the period's techniques knew the advantages of inclined planes based on granular material to dissipate energy in breaking swells". Then in the 20th century, although a reinforced concrete footing attachment to the wall had been included, the restoration of the southern area of the wall was still being considered-as in previous centuries-with a defence based on blocks, whose size (which before had been calculated by a method of trial and error) began to be defined based on existing scientific-technical knowledge, according to the project. The study indicates that "in 1981, engineers López, Peláez and Fages, from what was then the Headquarters of Ports and Coasts, warned that the blocks from 1949 in the Baluarte de San Roque area had rounded edges and that the swells used them as projectiles against the wall's surface". On this occasion, as in the 17th century, the breakwater was again used. "Let's take note that the breakwaters placed in previous centuries were cubic in form, very similar in size and weight to the first concrete blocks. As can be seen, the transition from one to the other is not coincidental", comments Juan José Muñoz. With the latest labours carried out in 1993, during which the section of the wall in front of the Cárcel Vieja was restored and where the greatest difference in respect of previous designs lay in the wall's inclination angle, a task that has occupied Cadiz during the last 400 years was completed.